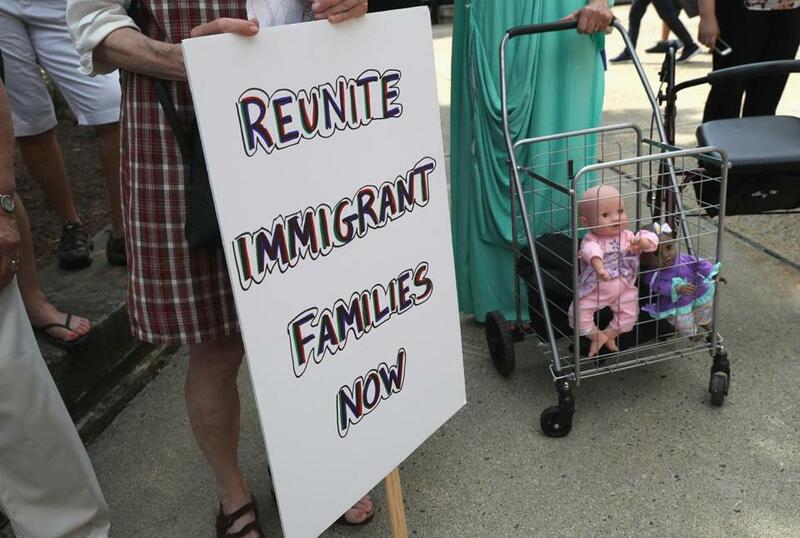 Protesters rallied against the separation of immigrant families in Bridgeport on July 11. While the Trump administration attempts to untangle the “zero-tolerance” policy that has separated thousands of immigrant children from their parents, child welfare experts are concerned the long-term effects are only now emerging. A public forum at Tufts University brought legal and mental health professionals together Tuesday to discuss the potential for lasting and traumatic effects on children who have been separated from their parents and how to provide services for affected families. “We know as these kids come into communities, they’re going to go to school, they’re going to have to go to hospitals and medical facilities,” Middlesex District Attorney Marian Ryan said. A court-ordered deadline for reunifications of immigrant children under age 5 with their families was set for July 10, but the process has been plagued by challenges and delays. A second deadline, to reunite children ages 5 to 17, is July 26. Upwards of 3,000 children have been separated from their parents under the immigration policy, which calls for the prosecution of anyone entering the United States illegally. To illustrate the psychological effects that the separations can have, Coan showed a recent image from a video posted on Twitter. It shows a father reuniting with his son. The boy could be seen standing stiff with a vacant look in his eyes. The families may have already experienced difficulty on the road north to the US border, after fleeing gang violence or poverty. Long-term, they’re at risk for being prone to disease, cognitive and emotional impairments, and early death because of these traumatic early experiences, he said. Coan cited studies done after WWII that showed that children taken from their parents to safety during the London blitz fared worse than those who remained with their families. Upon reuniting with their parents, some of the children who’d been evacuated from London showed similar symptoms of detachment as some of the children separated from their families under the “zero-tolerance” policy. He said though children are resilient and can bounce back from traumatic experiences, some may not fully recover. Children can’t distinguish between a life-threatening event and being separated from their parents. To small children, it’s all the same. Among the resources mentioned are programs in school for immigrant and refugee families as well as training for professionals who deal with the families on how to identify trauma. Candace Saunders, an associate professor of clinical practice in the School of Social Work at Simmons College, said the kind of separations immigrant children have recently experienced at the US border with Mexico can be devastating. Dr. Linda Forsythe, a psychiatrist at Massachusetts General Hospital, said it is crucial that adults who work with these kids earn their trust.